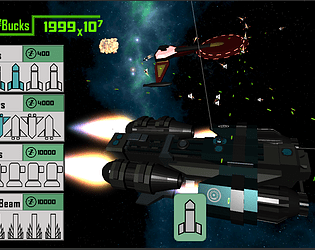 An idle game that focuses on space battles. This game was made by me and 2 of my coworkers. We always talked about doing a game jam together and finally decided to do one. Our goal was to make an idle game that was interesting to watch while you played. All the sound effects and music are pulled from freesound.org. FX Explosions and Volumetric Lines are free assets from Unity's asset store. Fun game. Especially liked how the large enemy ship would warp in. Little bug : Launch 5 missiles, stay 3 missiles to the screen, relaunch 5 missiles, only 2 is launch. Thanks, I caught the same error as well and went back and fixed it. It should be playable now.